In October 2010, Steve Jobs made a rare appearance on an Apple earnings call. Although he claimed that this visit was because of Apple’s first $20 billion quarter, this was not the case. Instead, Jobs took shot after shot at Apple’s competitors and their product offerings. Apple has fewer credible competitors than people think. Apple’s competitors are doing tablets wrong because 7-inch screens are a bad idea. Tablet users already have smartphones so they don’t need smaller form-factor tablets. The software running competitors’ tablets is inferior. Apple has a ton more apps than anyone else. Competitors can’t match the iPad’s price. Less than two years later, however, the tablet market is a far different place. This means a 7-inch iPad could be a great idea for Apple. The 2010 Steve Jobs would be resistant to this, but I think he could be convinced today. Here’s why. Although the number of new tablets is no “avalanche,” iPad now competes against the Kindle Fire and Barnes and Noble Nook, among other tablets. Announcements such as that for Microsoft’s Surface prove that Apple will have more and more serious competitors to the iPad over time. But dethroning iPad won’t require an avalanche of products, just one really good one. Apple proved this with iPhone and iPad. Apple hasn’t dominated the market by designing an “avalanche” of different devices running fragmented flavors of iOS (a la Android). Instead, Apple has put out one device at a time. Apple is successful because its devices are the best devices. Handsets such as the Samsung Galaxy S3 indicate that hardware makers may be catching up to Cupertino. A rival releasing a groundbreaking device is within the realm of possibility. A 7-inch iPad could further Apple’s lead in the tablet space. But that iPad has to be good, which means addressing Jobs’ next four critiques. iPad’s most serious competitors – the aforementioned Fire and Nook – prove that Jobs may have been wrong on these points as well. IHS iSuppli estimated in February that Amazon sold about 3.9 million Kindle Fires in 2011. Barnes and Noble has been cagey with sales numbers but claimed a $220 million income from the Nook in the last fiscal quarter of 2011. Smartphone use continues to rise, which means that many of those purchasing Fires and Nooks are also smartphone users. Although sales of the Fire and Nook are paltry compared to those of the iPad, the market has demonstrated that smartphone users are willing to purchase 7-inch tablets. My sister is one of those smartphone users. She wants to purchase an iPad but can’t justify the expense. She’s considering a Kindle or Kindle Fire instead. Why does she want a tablet? She is tired of reading e-books on her iPhone 4S. Although a Kindle won’t be as good as an iPad, it will be vastly better than her smartphone. And because she primarily will use the device as an e-reader, the 7-inch form factor is actually beneficial because of its greater portability. Jobs’ referenced screen resolution is also interesting. By saying, “One could increase the resolution,” he trivialized a difficult task. Squashing the iPad’s 1024 x 768 display into a 7-inch display (just 45 percent of the space) requires much greater pixel density – perhaps greater than Apple could manage prior to Retina Displays. If shrinking the display was impossible until recently, then a smaller iPad screen would have meant a different pixel count – the “fragmentation” Apple has always tried to avoid. As for sanded-down fingers – for as long as Apple’s touch interfaces have existed, so too have rumors that Apple was testing touch in different screen sizes. Of course Apple has “done extensive user testing,” and the success of its products indicates that Apple does “really understand this stuff.” If Apple issues a 7-inch iPad, it may mean that this user testing has come to fruition. They’ve figured out the 7-inch form factor and are finally ready to create a product in that size. Apple is one of the most effective technology developers in the world, and I give them the benefit of the doubt in assuming that their engineering talent has solved a 7-inch iPad’s problems. The way most of us use tablets, interaction difficulties at the 7-inch size may be even less of an issue than Jobs forecast. “Tablet” could grow to be the dominant computing form factor. As GDGT’s Ryan Block argued in a recent episode of This Week in Tech, that means we’re in year No. 2 of what could be a decade of growth for tablet hardware and software. Apple’s platform and application lead, although significant, is anything but insurmountable in this long-term view. Although I suppose that iPad’s having more than 35,000 apps in October 2010 (and more than 225,000 today) is good, I don’t find that quantity to be useful in any way. In fact, the number is a distraction — who has the time to sift through all of them? I don’t need 35,000 apps. I need six to 12 really good apps. Quality matters much more than quantity, and that is largely up to developers. Luckily, by asking little of our tablets, we’re making developers’ jobs easy. As I argued in March, platform is decreasingly important because of convergent experience. This is especially true regarding tablets. My roommate has a Nook. He can use it to read comics, read e-books, watch Netflix and browse the Web. Those are the exact same things my iPad delivers. Most people will use tablets similarly: for e-books, Web browsing, email, social media, and streaming media. These experiences will be available on all major platforms. Application developers will provide experiences as good as each platform can manage. Although the quality of the platform will be a factor, this too will converge over time as Google, Microsoft, and Apple focus more of their engineering prowess on tablets. For many, tablets are largely for content consumption, not creation. This means less interaction and fewer difficulties at the 7-inch size than Jobs foresaw in 2010. Of all of Jobs’ critiques, this one has proved to be the least true. The Kindle Fire costs $199, same as the 8GB Nook tablet. Amazon’s and Barnes and Noble’s profit margins at that price are slight (if they exist at all), but the booksellers are seriously undercutting Apple. They are sure to be selling many devices by doing so. Apple can address this with a 7-inch iPad, which could fit into Apple’s pricing structure at $299 (the iPad 2 and new iPad retail for $399 and $499). While this doesn’t immediately compete with the Nook and the Fire on price, a 7-inch iPad would be “just $100 more,” instead of “twice as expensive.” This pricing could make the jump to an iPad easier for consumers. The 7-inch iPad would become price competitive when Apple releases the second version of the device. This “new” 7-inch iPad would take over the $299 price with the “original” 7-inch iPad bumping back to $199. With the power and quality the iPad provides, I easily can see the device becoming even more ubiquitous when priced at $299 or $199. As we know from Steve Jobs The Lost Interview, Jobs didn’t “care about being right”; he “care[d] about success.” Stories such as the one of his initial resistance to and eventual acceptance of iPod on Windows prove that he could be persuaded. Although his position on a 7-inch screen seemed intractable in 2010, much could convince him of the idea’s merit in 2012. Steve Jobs isn’t in charge anymore, though. In his place is Tim Cook. Introducing a 7-inch iPad would be the biggest launch so far during his time as CEO. Introducing a 7-inch is not something Tim Cook or Apple will take lightly. Both his and the company’s future could hinge on its success. 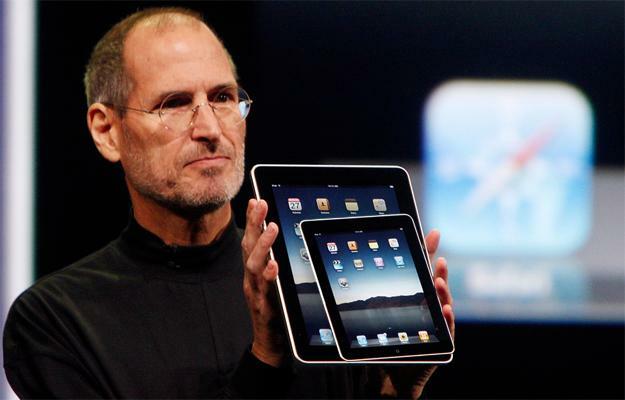 But as the first big launch of the “post-Steve” era, a 7-inch iPad could be one of the most notable in Apple’s history. These high stakes and Apple’s successful track record convince me that a 7-inch iPad would be compelling and competitive if announced – regardless of what the memory of Steve Jobs has to say.